In 1983, Brent et al reported the successful use of the flap as an axial-pattern fascial flap, a random-pattern fascial flap, and a free fascial flap for secondary ear reconstruction. In 1993, Cheney et al described 21 cases using the flap for a variety of reconstructions in the head and neck. Today, the temporoparietal flaps remain the only single-layered fascia flap that can be used as a pedicled vascular flap in the head and neck. The flap is thin and pliable, and it readily accepts a skin graft. Temporoparietal flaps can drape into concavities and over convexities, such as those present in the external ear, and they are highly vascular and resistant to infection. This reliability and versatility, particularly in the setting of trauma and devascularized tissue beds, make it a flap limited only by the surgeon's imagination. Temporoparietal fascia flap. A more accurate description of the layers of the scalp demonstrating the relationship of the temporoparietal fascia to the overlying skin and subcutaneous tissue and the deeper muscular fascia. In the temporoparietal region, this mnemonic is an oversimplification. The literature surrounding this anatomy contains a jumbling of nomenclature describing the various layers of temporal fascia, which can further frustrate surgeons trying to master this flap. To be accurate, the scalp in the temporoparietal area consists of more than 5 separate layers, and significant creativity would be required to massage the mnemonic SCALP from them (see the image below). The first layer consists of the skin and subcutaneous tissue. Immediately deep and firmly bound to this layer is the temporoparietal (sometimes called superficial temporal) fascia. This layer is contiguous with the superficial musculoaponeurotic system (SMAS) as it passes over the zygomatic arch into the mid face, and it is contiguous with the galea aponeurotica above the superior temporal line. 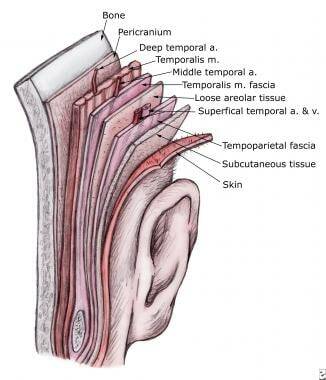 Beneath the temporoparietal fascia lies a loose areolar and avascular tissue layer that separates the fascia from the temporalis muscular fascia (sometimes termed the deep temporal fascia). This areolar layer allows the superficial scalp to move freely over the deeper and more fixed temporalis muscular fascia, temporalis muscle, and pericranium. Confusing the issue further is the division of the temporalis muscular fascia as it splits into a superficial and deep layer (of the deep temporal fascia) surrounding a fatty tissue pad at the temporal line of fusion, approximately 2 cm above the zygomatic arch. The temporalis muscular fascia is contiguous with the pericranium above the superior temporal line and is contiguous with the masseter muscle fascia below the arch. The superficial temporal artery supplies the temporoparietal fascia flap. The artery emerges from the parotid tissue, gives off the middle temporal artery, and traverses a tortuous course in the preauricular area. Approximately 3 cm above the zygomatic arch, it divides into the terminal frontal and parietal branches. The superficial temporal vein generally runs superficial to and with the artery, but variability, including branching or a posterior course, may be encountered. The auriculotemporal nerve, a sensory branch of the mandibular nerve, lies posterior to the superficial temporal artery within the temporoparietal fascia. The frontal branch of the facial nerve traverses an oblique course over the zygomatic arch, which can be estimated by a line connecting a point 0.5 cm inferior to the tragus to a point 1.5 cm lateral to the superior brow. This nerve also lies within the temporoparietal fascia, and flap elevation anterior to the frontal branch of the superficial temporal artery should proceed with caution to avoid injuring this nerve. Prior trauma to the area may also increase the risk of postoperative alopecia, which is always a risk anytime this flap is harvested. Brown WJ. Extraordinary case of horse bite: the external ear completely bitten off and successfully replaced. Lancet. 1898. 1:1533. Monks GH. The restoration of a lower lid by a new method. N Eng J Med. 1898. Hocaoglu E, Ozden BC, Aydin H. Lower eyelid reconstruction in a paediatric face: A one-stage aesthetic approach using the versatile temporoparietal fascia flap. J Plast Reconstr Aesthet Surg. 2012 Mar 27. [Medline]. Collar RM, Zopf D, Brown D, Fung K, Kim J. The versatility of the temporoparietal fascia flap in head and neck reconstruction. J Plast Reconstr Aesthet Surg. 2012 Feb. 65(2):141-8. [Medline]. Brent B, Byrd HS. Secondary ear reconstruction with cartilage grafts covered by axial, random, and free flaps of temporoparietal fascia. Plast Reconstr Surg. 1983 Aug. 72(2):141-52. [Medline]. Cheney ML, Varvares MA, Nadol JB Jr. The temporoparietal fascial flap in head and neck reconstruction. Arch Otolaryngol Head Neck Surg. 1993 Jun. 119(6):618-23. [Medline]. Brent B, Upton J, Acland RD. Experience with the temporoparietal fascial free flap. Plast Reconstr Surg. 1985 Aug. 76(2):177-88. [Medline]. Helal HA, Mahmoud NA, Abd-Al-Aziz AA. Reconstruction of post-traumatic full-thickness defects of the upper one-third of the auricle. Plast Surg (Oakv). 2014 Spring. 22 (1):22-5. [Medline]. [Full Text]. Reinisch J, Tahiri Y. Polyethylene Ear Reconstruction: A State-of-the-Art Surgical Journey. Plast Reconstr Surg. 2018 Feb. 141 (2):461-70. [Medline]. Hempel JM, Braun T, Patscheider M, Berghaus A, Kisser U. Partial auricular reconstruction with porous polyethylene frameworks and superficial temporoparietal fascia flap. Eur Arch Otorhinolaryngol. 2014 Oct. 271 (10):2761-6. [Medline]. Yung M. The Use of Temporoparietal Fascial Flap to Eliminate Wound Breakdown in Subtotal Petrosectomy for Chronic Discharging Ears. Otol Neurotol. 2016 Mar. 37 (3):248-51. [Medline]. Altindas M, Arslan H, Bingol UA, Demiroz A. Prelaminated extended temporoparietal fascia flap without tissue expansion for hemifacial reconstruction. J Plast Reconstr Aesthet Surg. 2017 Oct. 70 (10):1457-63. [Medline]. Mokal NJ, Ghalme AN, Kothari DS, Desai M. The use of the temporoparietal fascia flap in various clinical scenarios: A review of 71 cases. Indian J Plast Surg. 2013 Sep. 46(3):493-501. [Medline]. [Full Text]. Temporoparietal fascia flap. The important topography to mark on the scalp prior to incision includes the proximal trunk of the superficial temporal artery, the frontal and parietal arterial branches, the temporal line, and the approximate course of the frontal branch of the facial nerve. Temporoparietal fascia flap. After elevating the flaps, the superior, posterior, and anterior borders of the temporoparietal flap are incised. Temporoparietal fascia flap. After careful elevation of the flap with protection of the superficial temporal artery pedicle, the flap is draped into the recipient bed. The pliability of the flap make it uniquely suited for draping over cartilage and bone.